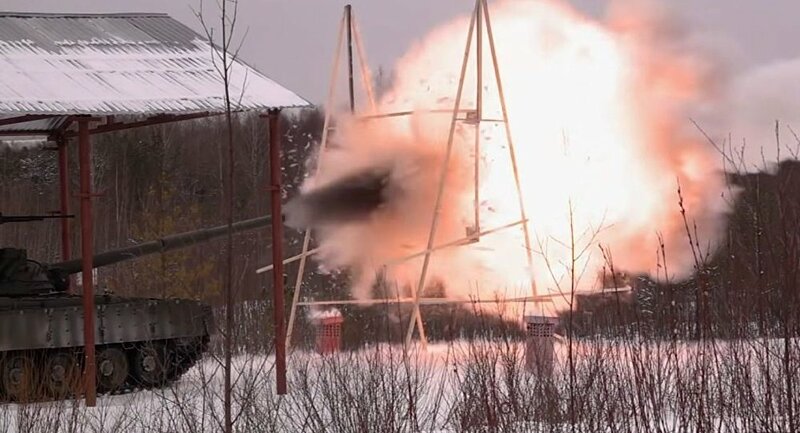 The Russian T-80 tank, famous for its gas-turbine engine, has been caught on video shooting something very unusual. In the video, produced by Zvezda TV Channel's ‘Combat Approved' show (known in Russia as ‘Voyennya Priyomka') military servicemen can be seen putting a piece of a wooden log into the cannon and filling the turret with water before firing the weapon. The show's crew constructed a makeshift target made of timber and stretched ceiling material to see if the strange ammunition survives the shot. As video shows, the log piece was entirely vaporized. The video immediately caught the attention of internet users, with YouTube commenters dubbing the tank a "log-thrower" or "timber shooter" and cracking jokes about new Russian fighting know-how. Others recalled a dubious Soviet military anecdote in which a tank crew fired a loaf of stale bread at an ‘enemy' tank during military drills, allegedly resulting in shell-shock for the enemy crew. Jokes aside, however, the log shot is more than a fancy stunt. This procedure is a mandatory test conducted after the gun undergoes repair, as it allows for the detection of potential defects before an actual shell is loaded, particularly as firing a cannon with imperfections can result in catastrophic consequences. The water poured into the gun is needed so that the wooden ‘shell' does not catch fire during the shot. It's hard to disagree that it works perfectly as a spectacular show, as well. Logs used during tests should not be confused with the logs usually strapped to all Russian tanks, often puzzling people unfamiliar with the operation of armored tracked machines. This log is used when a tank gets stuck in the mud: when tied to the tracks, the log allows the tank to pull itself out of sticky substances as it gets dragged beneath the tank from front to rear. The operation can be repeated as necessary.